The easiest way to reach the top of the Mealy Mountains in Southern Labrador is to charter a helicopter where you can touch down and explore the surrounding landscape. Over the rocky area of the Mealy Mountains, a waterfall rushes over the large rocks and then calms itself until it reaches the next massive rock ledge. 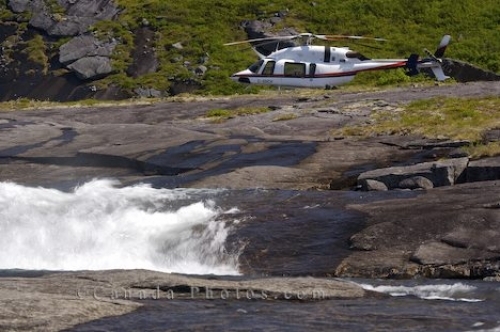 Picture of a helicopter on the landscape of the Mealy Mountains in Southern Labrador near a waterfall running the rocks.